RAWALPINDI: Chief of Army Staff (COAS) General Qamar Javed Bajwa on Thursday said the threats faced by the country demand a comprehensive response from state institutions. “Full spectrum of threat demands comprehensive national response involving all institutions of the state,” said the army chief while delivering a keynote address on ‘Security of Pakistan” during a three-day international conference at Air University Islamabad. 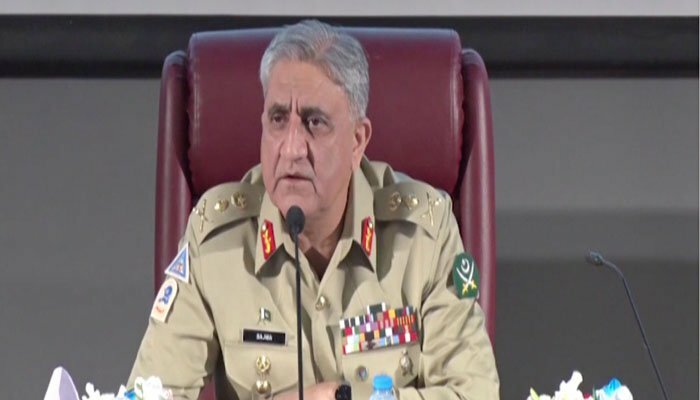 Gen Bajwa said that the Pakistan Army will continue to serve the interests of the nation to sustain socio-economic progress and lauded the efforts of the armed forces in the war against terrorism. “Terrorism has been effectively contained with nation’s support but we need to remain vigilant and follow the correct course to move from survival to revival,” he said. On August 6, the army chief addressed internees at ISPR Directorate that the nature and character of war has changed. “Youth now is prime target of our enemies in the hybrid war,” he said advising the youth to stay determined and defeat all such threats to take Pakistan forward to its rightful destination as part of the nation.